A review requested by Erin, with thanks to supporting Alternate Ending as a donor through Patreon. History remembers Franco Zeffirelli mostly for his 1968 adaptation of Romeo and Juliet, and history goes on to remember that film as Ground Zero for the next half-century (and counting) of the works of William Shakespeare as a reliable source of prestige cinema material. What history has fudged a bit is that Romeo and Juliet, though a massive hit, nominated for Best Picture among other Oscars, and clearly influential almost instantly, was in fact Zeffierelli's second Shakespeare adaptation in as many years. In 1967, the director's first film in English (and only the second one at all) was a big-screen version of The Taming of the Shrew, the first since the legendarily awful 1929 version starring Mary Pickford and Douglas Fairbanks. That checkered history would be enough, I think, to make anyone pause. But if I were living in 1967, I think I could come up with quite a substantial list of reasons to assume this would be a terrible flop. There is, for starters, the matter of The Taming of the Shrew itself: one of Shakespeare's most inelegant, dated plays, it suffers from a repetitive second half that culminates in a famously difficult final scene that is either an immensely subtle satire of patriarchal attitudes, or (more likely, in my guess) an endorsement of those attitudes that's startlingly happy and forthright even for the 1590s. Then, there's the complication that this is one of the comedies, and the comedies have always had a much harder time at the movies than the tragedies or the histories; in more than 90 years of sound cinema, there has been a grand total of one that everybody agrees is at least pretty good, the 1993 Much Ado About Nothing. In 1967, that probably wouldn't have been as big of a concern as the fact that, regardless of genre, Shakespeare hadn't been a source for any major mainstream films since the 1930s, and most of the ones made in that decade were pretty bad. 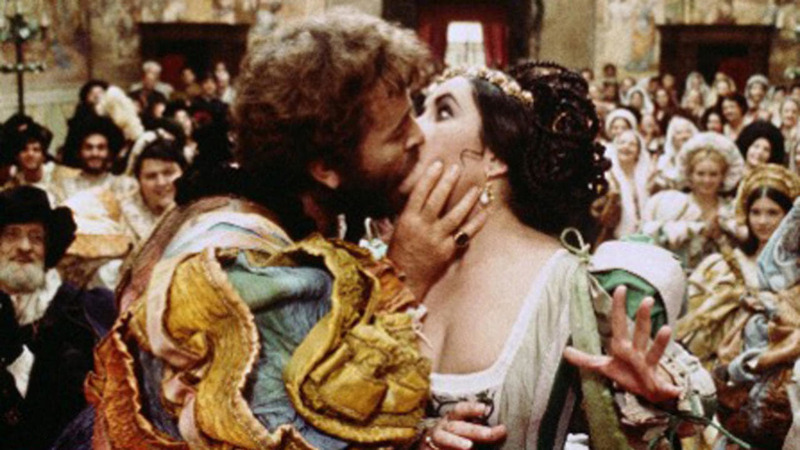 On top of all of this, The Taming of the Shrew had, after a couple of cast changes, ended up as a vehicle for real-life couple Elizabeth Taylor and Richard Burton (the former of whom had no training in Shakespearean acting and learned so much during the production that she asked to have her earliest scenes re-shot), who had only a few years earlier played against each other in another costume drama, the infamous boondoggle Cleopatra. Despite all of these strikes against it, The Taming of the Shrew was, improbably, a huge hit. Just as improbably, it's a pretty strong movie. The film chops the play apart and reconstructs it to feel, somewhat miraculously, like it was always designed to be seen this way; there's no lingering sense that this was plotted according Elizabethan stage conventions (there's also, it hardly needs to be mentioned, no "play within a play" framework). It's not a perfect edit: Lucentio (wee baby Michael York, receiving an "and introducing" title card), the nobleman and student newly arrived to Padua, is set up as our introduction to the world and feels very much like he and his servant Tranio (Alfred Lynch) are going to be with us for the long haul for most of the film's first ten minutes. You may or may not know the bit: Lucentio falls in love with Bianca (Natasha Pyne), second daughter of the wealthy Baptista (Michael Hordern), and poses as a Latin teacher while Tranio poses as Lucentio. But Baptista has made it clear that none of the many men vying for Bianca's attention gets to court her until he's married off his elder daughter, the intemperate, wrathful Katharina (Taylor). Enter Petruchio (Burton), a libertine and golddigger who will happily put up with a bit of wrath it if means that he's first in line for Baptista's fortune. So back to that imperfect re-arrangement of the material: the three screenwriters (giving fulsome credit onscreen to Shakespeare, "without whom they would have been at a loss for words") have mostly removed the Lucentio/Bianca material, which makes those opening minutes with York end up feeling like a false prologue. Which is too bad: York isn't quite as good here as he'd be in Romeo and Juliet (where he gives one of my favorite screen performances of Shakespeare), but he's pretty damn good, absolutely nailing the fresh-faced awe of a young man arriving in a new city and falling in love, and delivering the dialogue with a giddy speed that demonstrates an excellent strategy for making the comedies work onscreen. And also, false prologues are always bad. At any rate, the film is, as it must be, almost entirely given over to Burton and Taylor, and Zeffirelli has made the basic but crucial decision to direct them like they're in a modern slapstick comedy. Taylor snarls and snaps out her dialogue with a deep-set anger that suggests that she hadn't gotten the prior year's Who's Afraid of Virginia Woolf? out of her system, while also rolling her eyes and making no end of aghast faces as Burton. For his part, that actor is clearly having a ball, playing Petruchio as a self-satisfied boor, as much Falstaff as Petruchio, ebullient and hammy and full of drunken contentment. It's at least somewhat a nonstandard take on on the role, and it causes some problems: it's less clear than it should be that Petruchio is putting on a performance of his own to "tame" Kate. But it is, in and of itself, wholly delightful, one of the most casual and spirited Burton performances I've ever seen in a movie, and one of the clearest examples I can name of an actor who understands every single word of Shakespearean dialogue and knows exactly why his character is saying it. The wordplay in The Taming of the Shrew can be labored, to be blunt about it, but in his amiable, slurry way, Burton makes it sing. Mostly, though - and this is key to why the thing works - Zeffirelli doesn't have the leads play this like they're in a comedy (this is not true of the side characters; Lynch even breaks the fourth wall at one point to deliver a boggle-eyed aside to the camera). Rather, he lets the stuff of a comedy happen around them: mildly wacky sound effects (including a moment where, god bless it, a lightning strike punctuates a meaningful line of speech), broad physical comedy, lots of pulled faces by background characters. For Taylor and Burton, this remains a battle of wits, emphasis on the battle - they do a superb job of playing the early stages of the relationship, when it remains tense and hostile and Kate is at her most blatantly angry. This means that the softening of that character is a much harder sell - the notorious monologue at the end is especially hard to parse as a result - but the post-marriage part of the play isn't as good as the nasty-minded "courtship" anyway, so it's not a huge loss. The other thing played completely straight is the setting. There are some wonderful street sets, rightfully Oscar-nominated, that feel cramped and busy with life, and the filmmakers keep them doused in endless rain. It's not "realistic" - if nothing else, seeing English-language signage all around Padua and Verona breaks any meager illusion the film constructs, but the even lighting and general cleanliness contribute to a certain artificial feeling as well - but nor is is polished and stagey. It is a very stuff-filled mise en scène, with lots of props and furniture and corners full of people and things. The world around Kate and Petruchio is a messy, sprawling one, and that helps ground the film in a living environment. Yes, that is the word: living. The Taming of the Shrew is above all a lively movie, moving fast, constantly visually stimulating, noisy - Nino Rota's score is a particular delight - and rife with chances for the actors to do all sorts of business. Perhaps because he's adapting a comedy, and perhaps because it's this comedy, Zeffirelli doesn't seem too worried about making his film feel prim and dignified. It's a sprawling, loud film, and even if it rarely or never comes up to the level of "funny", it's still bright and vital. It doesn't solve most of the problems an adaptation of this play should be thinking about, but it's at least a peppy entertainment, something far too many Shakespearean adaptations in the subsequent half-century have unfortunately forgotten to be, in their zeal to be prestigious.